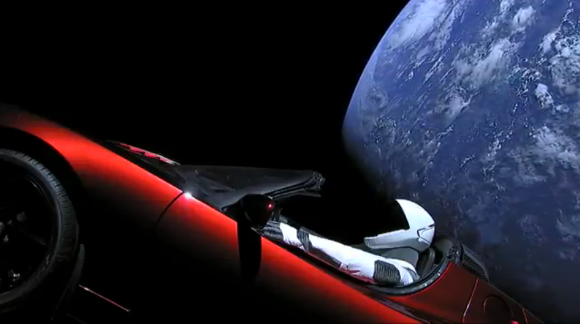 So it’s been a year since Starman the mannequin was launched into space in his cherry red Tesla Roadster with Hot Wheels model Tesla on the dash. Starman is in an elliptical orbit around the sun, taking him outside of Mars’ orbit. There is little hope that Starman will ever be seen again, let alone retrieved for study. So what’s Space X up to next with the Falcon Heavy that launched Starman? SpaceX is gearing up for its first launch with a paying customer. I haven’t thought of this guy in a year! It was so neat when it went up — happy for someone keeping track of updates. Hawk’s 2010 short story submission was chosen for "Eclectic Flash: The Best of 2010". She won the Write to Win contest in the Fall 2009 edition of "Writers’ Journal". Young attended college on a Faulkner writing scholarship and was editor of his school paper. He was a freelance writer for the "Cajun Press" in Avoyelles Parish. Co-authors Eddie-Joe Young (@EddieJoeYoung13) & Elsha Hawk (@ElshaHawk) writing #scifi and #fantasy #novels. We like dragons, pirates, ninjas, vikings, harpies, & underdog heroes.